The catapult was an ancient siege machine that could hurl heavy objects or shoot arrows with great force and for considerable distances. 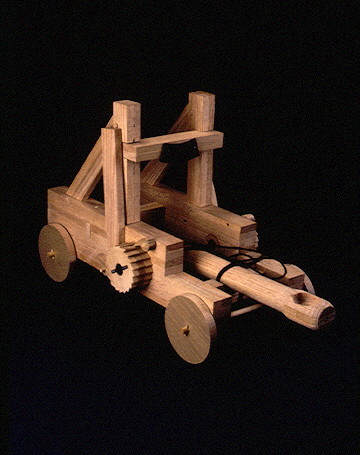 Some catapults could throw stones weighing as much as 350 pounds for distances greater than 300 feet. The Greek Dionysius the Elder of Syracuse, who was looking to develop a new type of weapon, invented the catapult about 400 BCE. Thereafter, it became a key weapon in warfare and remained so up through mediaeval times. Two major catapults evolved from Dionysius's invention: the double-armed machine, or ballista, used for shooting arrows, and the single-armed catapult designed for hurling large objects. Although the Romans added wheels to both types of catapult for maneuverability, very little in the design of the machine changed.The reconstruction shown here is of a single-armed stone-hurling catapult, approximately two feet long and one-and-a-half feet tall. Its hurling arm is driven by a cocked, winch-pulled cord.